Dots by Annie Cheung is a solo self-revelatory performance, which she describes as “a unique genre of theatre which combines therapy for the performer and performance for the audience”. 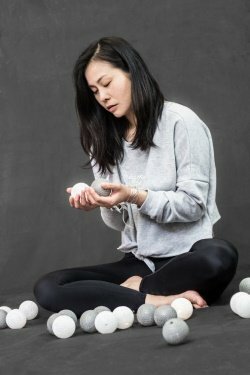 The show starts with Cheung with her hands tied and tape across her mouth, in a sparse space with two chairs and a number of grey and white balls that represent good and bad memories. It becomes clear quite quickly that she has been imprisoned by herself, as she keeps talking back at an invisible someone who is most likely her inner voice, the one we all have. You know the one, the one that tells you that you’re terrible and will never amount to anything. In Dots, that part of Cheung has trapped her and given her a puzzle to solve, to work out her issues, her depression and bad thoughts, which she then tries to do right in front of us. The problem with this kind of show is that unless you like the person in it, it becomes very tedious. Thankfully, you can’t help but like Annie Cheung. She’s engaging and charming, and easy to watch. And she tells her story beautifully with passion. She pours her heart and soul into the work, but I do think she would have benefited from working with an outside director on the piece, as there were some technical issues that are easier to spot from the outside. The biggest issue with the show was that a lot of it took place on the floor, for example with arranging the balls in different ways, and from where we were sitting, we just couldn’t see it. We know she arranged the items in different ways to “solve the puzzle”, but if there was any significance to the patterns she tried, it didn’t translate to most of the audience. I would say only the first and second row could see anything that happened on the floor. Another issue is that Cheung’s delivery at times was a bit fast. We could hear her, but there was more space for thought and thinking in her conversations with her other self, to make the point land better. The conversation didn’t feel quite real. With regards to the subject matter, it was very much a show about acting for actors, and the larger chunk that was mostly about this, which was hard to connect with for someone who isn’t in the industry, like my companion. When she later went on to talk more about her relationship with her husband and her husband’s career, the issues were a lot more universal and a lot more engaging. That said, how she jumped from arguing with her inner voice to talking to other elements of her life was very interesting, and I’m sure many people would love to talk to their partner’s work, for example. And when we saw the child version of herself, it was just adorable. We have to commend Cheung for powering through in a small and extremely hot room without letting her energy drop. By the end of the show, we were all melting. And it was a very sweet ending that made us smile. As she said herself, “It’s a bit cheesy, you know. But I like it.” And that’s how we felt, too. All in all, it was an interesting show, but it needs more work. Teetering dangerously between tragedy and comedy Annie takes you into the high-achieving, low-esteem world of a lawyer turned actress and her ever questioning alter ego. Inspired by a real-life story, DOTS is a deeply poignant, and, at times, frankly farcical reminder of life’s real challenges – serious stuff that doesn’t take itself too seriously. DOTS is a solo self-revelatory performance, a unique genre of theatre which combines therapy for the performer and performance for the audience. This piece was born as a result of six therapy sessions with my dramatherapist, who specifically worked through my current struggles as an actress, a wife and a living person. With utmost honesty and humour, the play explores high functioning depression, medically referred to as Dysthymia or Persistent Depressive Disorder, a mood disorder which is hard to spot but becoming increasingly prevalent.